To continue calling him a rising star, even if he is just 18 years old, is suddenly out of date, behind the times, so last spring! In a few short weeks, superstardom has arrived in a shower of fireworks for Luka Doncic, who is Euroleague Basketball's choice by acclamation as MVP for October in the Turkish Airlines EuroLeague. 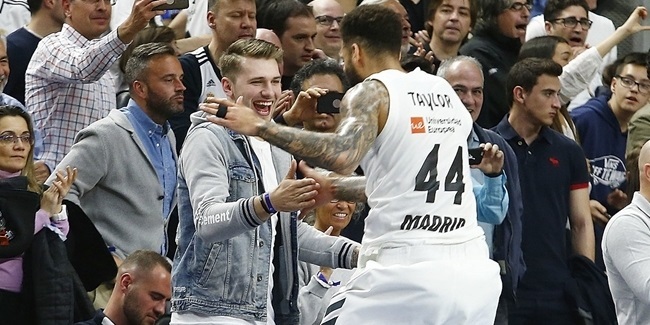 With more responsibility on his shoulders at a younger age than any player in memory, Doncic made sure that injury-riddled Real Madrid finished October as one of just two EuroLeague teams unbeaten through four rounds of play - and he did so in breathtaking fashion. Among his feats this month, Doncic posted the highest performance index rating, 129, through four games of any EuroLeague player since 2000. His 96 points also matched the most this decade in a season's first four games. In Madrid's first win, he broke his previous best scoring total by 10 points; in the last two, he matched that new career high and exceeded it by a point. He also became the first player to sweep the weekly MVP honor in a double-round week of games. As such, Doncic becomes by far the youngest monthly MVP in the 13-year history of the award - and among the most indisputable honorees, as well. The MVP of the Month honor is now in its 14th season. Although statistics and performance index ratings are taken into consideration for the award, they alone do not determine who is honored. The winner is named by Euroleague Basketball based on his and his team's performance. The award for October was based on the four regular season games that all teams played during the month. 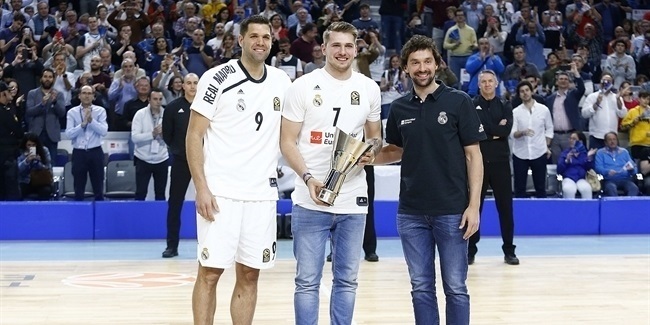 Doncic came into the season off a magical gold-medal run for Slovenia at EuroBasket, but had the difficult task of replacing his injured Madrid teammate Sergio Llull, last season's EuroLeague MVP. On the road against Anadolu Efes Istanbul in Round 1, he exploded for 27 points, a new personal best, and a PIR of 32, matching his high until then, as Madrid cruised to victory, 74-88. 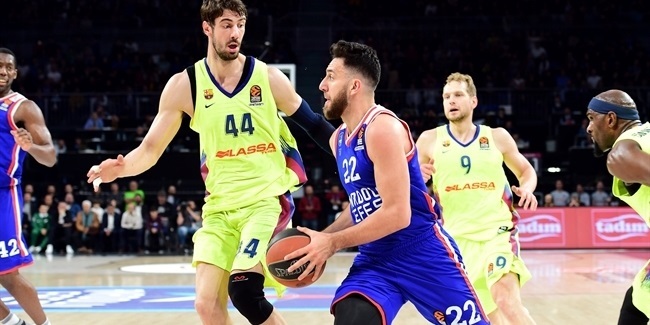 At home the next week, Madrid handed CSKA its earliest loss in seven years, 82-69, as Doncic scored 14 points and led the winners in PIR with 21. Then came a two-game week in which Doncic reached another orbit. At home against AX Armani Exchange Olimpia Milan on Tuesday, Doncic raised the roof with 27 more points to go with 8 rebounds, 5 assists and 3 steals for a PIR of 41 as Madrid won 100-90. At 18 years and 8 months, he became the youngest player ever to surpass 40 in PIR. Two nights and a 3,300-kilometer trip later, in Round 4, he had 4 points at halftime against host Zalgiris Kaunas. By the time the game finished, in regulation time, Doncic has posted a new career high of 28 points to go with 9 rebounds and 4 assists for a PIR of 35, his fourth team-high index rating of the month. Madrid wasn't just any 4-0 team in October, either. You have to go back to the club's own 2013-14 edition to find another that opened the season with four double-digit victories. Most remarkable, however, is that a teenager led one of the most-decorated clubs in the sport every step of the way in October. Doncic finished the month as the league leader in scoring, with 24.0 points per game, and in PIR, at 32.3. He also ranks second in free throw efficiency (88.9%), eighth in rebounds (6.8) and two-point accuracy (65.4%), 14th in steals (1.3), 15th in three-point accuracy (43.4%) and 16th in assists (3.8). Basketball historians may look back on October as the month when a boy wonder made everyone forget about his age by placing himself on the same level as the EuroLeague's biggest stars, not to mention putting the eyes of the basketball world firmly upon him. Doncic will receive his October MVP award at an upcoming Madrid home game.